Join us to celebrate the arrival of Spring with a delicious Easter Brunch at Miradoro and complimentary Easter egg hunt at Tinhorn Creek (Easter Egg hunt at 1:30 PM only). Call 250-498-3743 or email to reserve your spot today. straightforward and seasonal. Reservations are required. $38 per person. *Dinner themes are subject to change without notice. Fall 2019 dinner themes - to follow late Summer 2019, watch this space! Enjoy a vineyard walk with our Viticulturalist Andrew Moon while sampling Tinhorn Creek wines. Learn all about vineyard practices, sustainability, and the Golden Mile Bench sub-appellation. 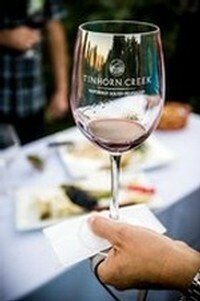 Afterwards, enjoy an alfresco reception with Tinhorn Creek wines and canapes by Miradoro Restaurant. 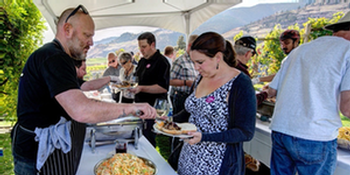 Celebrating its eighth year, the Pig Out festival offers a perfect way to herald the coming of the summer season in Oliver Osoyoos Wine Country. Between 1-4pm the chefs (including Chef Jeff from Miradoro) will be showcasing their hog roasting skills at the outdoor-tented festival, which takes place amongst the beautiful organic vineyards of Covert Farm in Oliver. Every year, Pig Out celebrates a different culinary theme and this year will be no different. A cornucopia of dishes featuring local ingredients will be offered alongside the wineries of the Oliver Osoyoos Winery Association, pouring new releases and fan favourites. Officially welcome Spring with our Crush Club Spring Party. Your ticket includes four tickets for Paella created by Chef Jeff Van Geest and three guest chefs, along with accompanying wine pairings. Choose the shuttle option and you'll receive an additional glass of wine included with your ticket. Join us for Yoga in the Vineyard! Suitable for all levels, this gentle yoga is a perfect way to spend an hour on a Saturday morning. Come feel the sun on your face and your toes in the grass as you do yoga in the amphitheatre with spectacular views and a tranquil setting. Tickets are $10 and are available online. Enjoy $6 wine by the glass with complimentary nibbles in our demonstration vineyard. 4:00 to 6:00pm - every Friday until September. Stretch and unwind surrounded by the beauty of the Golden Mile Bench. Bring your Yoga mat and enjoy 1-hour classes suitable for all levels. Outdoor yoga on the grass in our Amphitheatre. Time: 9.00am. Certified Instructors. Dress appropriately for the weather. Minors must be accompanied by an adult. Dogs are not permitted. The event will be cancelled due to inclement weather, refunds will be given as there is no alternate location available. Stretch and unwind surrounded by the beauty of the Golden Mile Bench. Bring your Yoga mat and enjoy a 1 hour classes suitable for all levels. Summer evenings were made for this. Dine under the stars while enjoying a multi-course dinner by Miradoro paired with Tinhorn Creek wines, while the moon comes up over the mountains. Royal Astronomical Society Telescopes available for viewing the stars. Price includes dinner, wine and gratuities. 4:00pm to 6:00pm - every Friday until September. Afterwards enjoy a 3-course lunch by Miradoro. Event starts at 11:00am and ends at 1:30pm. Join us for an evening of exceptional food and wine as part of the Okanagan Wine Festival. Chef Jeff Van Geest invites a guest chef into the Miradoro kitchen to partner on a delicious and unique multi-course gourmet dinner paired with Tinhorn Creek wines. Tickets are $95 + tax & grat. Seating is limited. Call or email Miradoro to reserve your spot today! Shuttle service from Penticton $20 per person, book shuttle with Miradoro restaurant when making your reservation. simple, straightforward and seasonal. Reservations are required. $38 per person. Held at Miradoro Restaurant at 6:30 pm on Tuesdays from October through December, and March to May, the Communal Table will bring together locals and visitors to celebrate regional fare that is local, rustic, simple, straightforward and seasonal. Reservations required. $38 per person. To celebrate 'Winter in Wine Country' Miradoro Restaurant is offering delicious BC Quadra Island Honey Mussels with hand-cut French fries paired with Tinhorn Creek Vineyards wines. Plump, full-flavored Oceanwise mussels with a choice of flavourful sauces. 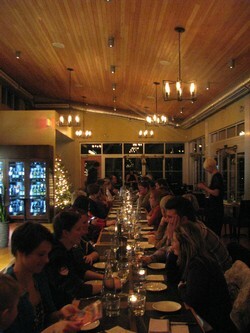 Call 250-498-3742 for reservations and more info. Open house at the winery on Saturday, November 23rd and Sunday, November 24th, 10 am to 4 pm daily. Drop in for complimentary mulled wine, yummy Holiday soup from Miradoro, sweet and savoury snacks and free gift wrapping. Enjoy harp music, artisan craft stalls and more. Let us help you find the perfect gift for that special someone, or why not just come in and treat yourself! Celebrate New Year's Eve at Miradoro with a special 4-course gourmet menu crafted by Chef Jeff and his team. Say cheers with a complimentary glass of bubbles at midnight and dance your way into 2020 with our DJ from 9 PM. Please call 250-498-3742 or email info@miradoro.ca to book your table. Menu $65 + tax & grat. Wine pairings $30 (optional) + tax & grat.